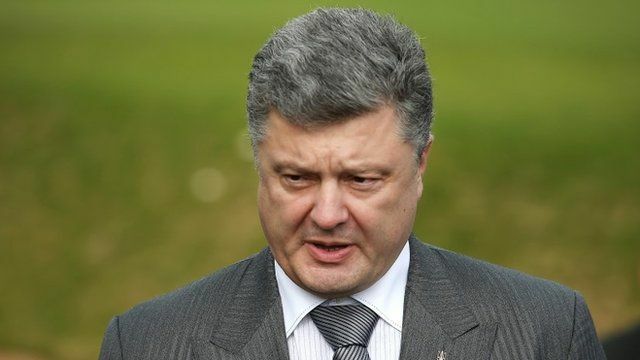 Poroshenko on ceasefire deal Jump to media player The Ukrainian President, Petro Poroshenko, says he has ordered the military to declare a ceasefire in eastern Ukraine. Ukraine stability 'brutally undermined' Jump to media player Ukraine's President Petro Poroshenko says that his country's stability and security has been "brutally undermined" by Russia. Tense Ukraine troops turn on cameras Jump to media player Western countries are preparing to tighten sanctions on Russia over its action in Ukraine, US and British officials say. Obama condemns Russian 'assault' Jump to media player US President Barack Obama has condemned the "brazen assault" on Ukrainian sovereignty by Russia. Ukraine conflict so far - in 2 mins Jump to media player Tim Willcox presents a timeline summary of the events that bought the country to it's present situation. Nato: Putin has 'zone' ambition Jump to media player Nato chief Anders Fogh Rasmussen says Russia is not sincerely interested in a Ukraine ceasefire and is continuing to destabilise eastern Ukraine. The Ukrainian President, Petro Poroshenko, says he has ordered the military to declare a ceasefire in eastern Ukraine. Speaking at the Nato summit in Wales, Mr Poroshenko said that it was important for the ceasefire to hold.